Today one more Gas Blender Instructor saw the light. Stuart took op the opportunity to complete the DSAT Gas Blender and DSAT Gas Blender Instructor course before he took off to Phuket, later today. 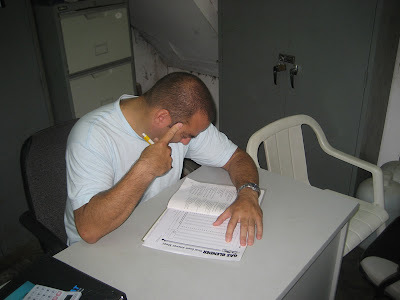 Here is Stuart, sweating it out during the Gas Blender exam, 50 questions and a passing rate of 80% is required, which he managed easily. Stuart at the controls. During the exam, there are some questions that need to be answered with a DSAT Gas Mix Calculator, a CD-Rom that comes with the manual(s). 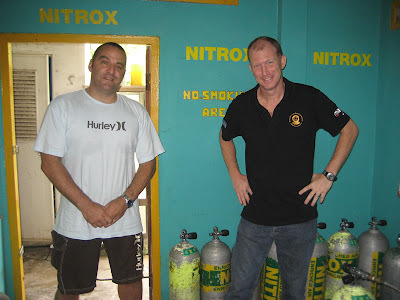 Stuart's interest was peeked for this course after he completed the Nitrox Instructor course with me. 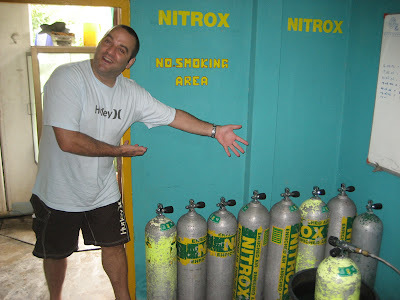 He was already certified as a Nitrox diver. 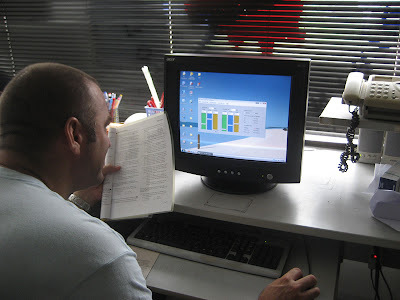 Being a Nitrox Instructor however, is a prerequisite for the DSAT Gas Blender Instructor course. Showing off his filling skills. Tanks everywhere and Stuart being happy to fill them up. A picture of the boss and Stu at the end of the day. It was fun Stuart and hope to see you back for your IDCS course next year!